A Wayne State University School of Medicine fellow will be honored in March for developing a novel curriculum for medical residents that blends various methods of education related to patients on mechanical ventilation, delivering hands-on experiences in a controlled environment. 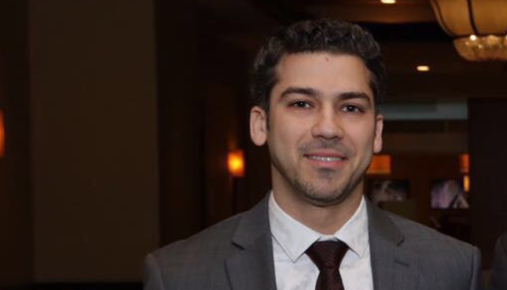 Abdulrazak Alchakaki, M.D., won the Association of Pulmonary and Critical Care Medicine Program Directors' Abstract Award for Medical Education Research for "A Novel Simulation-Based Mastery Curriculum for Mechanical Ventilation (MV) in Pulmonary & Critical Care Training Programs." MV helps patients breathe when they are recovering from surgery or critical illness, or cannot breathe on their own, and helps raise oxygen levels when needed. The curriculum uses education methods such as didactics, high-fidelity simulation and clinical rounds in an environment in which "they are allowed to make mistakes and learn from one-on-one debriefing with instructors," Dr. Alchakaki said. "The project has to be feasible, affordable and effective, and this is what we aimed for when we designed it." Pulmonary and critical care medicine training program directors and faculty are also eligible for the award, which is given to one member a year. He will receive the award at the organization's 2018 annual conference March 8-10 in Salt Lake City. Dr. Alchakaki is a fellow in the School of Medicine's Pulmonary Critical Care Education track expected to graduate in June. He completed his residency at the Detroit Medical Center's Sinai Grace Hospital after earning his medical degree from Jordan University of Science and Technology. He is mentored by Associate Professor of Medicine Abdulghani Sankari, M.D., Ph.D., who directs the PCCM Fellowship Program. "The clinician-educator track is part of our accredited Pulmonary Critical Care Fellowship program, which was established last year in parallel to our three-year clinical fellowship program. Dr. Alchakaki is the first fellow to go through this program," Dr. Sankari said. "The program is funded by the Detroit Veterans Affairs Medical Center, and is the second of its kind in the country, with aims to train future educators using innovative methods of teaching from simulation to bedside." While competency in proficient and safe mechanical ventilation is important in pulmonary and critical care medicine training, most academic medical centers utilize a didactic-based method for MV teaching. "However, there is a clear gap in proficiency between MV didactics and applying the knowledge in real-life clinical applications with critically ill individuals with changing lung mechanics. This gap may affect clinical outcomes, including mortality and morbidity. To improve MV education in our program, we created a mastery curriculum for learning MV that aims to improve knowledge and acquire essential competencies for safe and evidence-based clinical practice," Dr. Alchakaki said. The training team includes a program director, medical education fellow, respiratory therapist and simulation coordinator. A 34-item checklist was used for the mastery simulation sessions to assess competencies, including indication for ventilation, initiation, troubleshooting and liberation of MV. Seven post-graduate Year 4 trainees have completed the course as part of their orientation, with each trainee spending less than five hours to complete the seven-step training. "I am very thrilled with the award. It tells me that even small ideas can translate to huge impact and appreciation. Working with great mentors helped me in advancing this idea to what it is now," Dr. Alchakaki said. "I have a love and passion for teaching and turning learning time into learning experiences that trainees enjoy, retain and take with them to the bedside for better patient care." The abstract was also accepted for presentation at the American Thoracic Society meeting in May. The team behind the project, which includes Shahram Maroof, M.D., Maryjean Schenk, M.D., M.P.H., respiratory therapist Norman Theaker and Connie Inman, PA-C, is planning further follow-up to assess long-term retention and implementation of the curriculum.